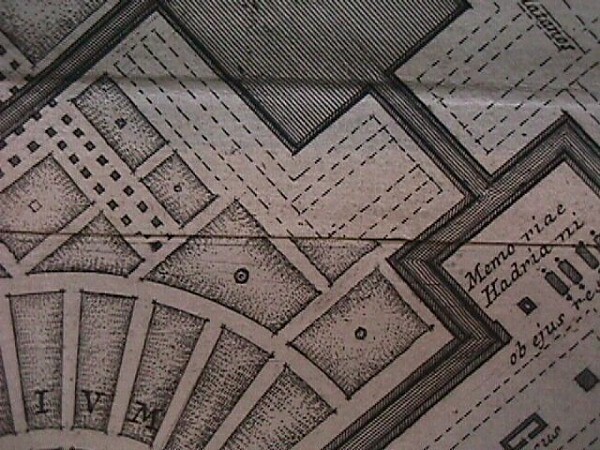 Circus Flaminium is misorientated within the Ichnographia, but, judging from the Forma Urbis fragment, it is not obvious as to its orientation vis-à-vis the Theater Marcellus. Porticus Aemlia, this is the Forma Urbis plan formation that Piranesi copies for his design of the Porticus Septa Julia. Horra Galbae, this is not in the Campo Marzio, but the Forma Urbis fragment is exactly the plan of Piranesi's Septa Julia. Could this be a case of mistaken identity or of cribbed information? Iseum et Serapeaum, in the Forma Urbis, depicted differently in the Ichnographia. I also have some thoughts regarding the Ichnographia as a stone fragment: this presentation on Piranesi's part could also be considered a reenactment of the Forma Urbis--a virtual reenactment of discovering the great missing piece of the "puzzle" that will bring all the other piece to a grand cohesion. (I am here reminded of Tafuri's opening comments to The Sphere and the Labyrinth, and I'm sure I can now make a good valid connection and elaborate on how the fragment stone map of the Ichnographia represents a kind of "missing link," a piece that will explain all there is to explain about the "real" architecture of Imperial Rome. "There comes a moment (though no always) in research when all the pieces begin to fall into place, as in a jig-saw puzzle, where all the pieces are near at hand and only one figure can be assembled (and thus the correctness of each move be determined immediately), in research only some of the piece are available, and theoretically more than one figure can be made from them, In fact, there is always the risk of using, more or less consciously, the pieces of he jig-saw puzzle as blocks in a construction game. For this reason, the fact that everything falls into place is an ambiguous sign: either one is completely right or completely wrong. When wrong, we mistake for objective verification the selection and solicitation (more or less deliberate) of the evidence, which is forced to confirm the presuppositions (more or less explicit) of the research itself. The dog thinks it is biting the bone and is instead biting its own tail." Carlo Ginzburg and Adriano Prosperi, Giochi di pazienza: Un seminario sul "Beneficio di Cristo" (Turin: Einuadi, 1975), p. 84. I was surprised to find that there are many references to the Campo Marzio in The Sphere and the labyrinth than I had initially noted. I now have to collect all of the texts and then analyze-critique them as well. I may also find some useful citings i the beginning of the first chapter. There are many yellow sticky notes in the book that I have not yet organized and/or transcribed. p.1: “There comes a moment (though no always) in research when all the pieces begin to fall into place, as in a jig-saw puzzle, where all the pieces are near at hand and only one figure can be assembled (and thus the correctness of each move be determined immediately), in research only some of the piece are available, and theoretically more than one figure can be made from them, In fact, there is always the risk of using, more or less consciously, the pieces of he jig-saw puzzle as blocks in a construction game. For this reason, the fact that everything falls into place is an ambiguous sign: either one is completely right or completely wrong. When wrong, we mistake for objective verification the selection and solicitation (more or less deliberate) of the evidence, which is forced to confirm the presuppositions (more or less explicit) of the research itself. The dog thinks it is biting the bone and is instead biting its own tail.” - from: Carlo Ginzburg and Adriano Prosperi, Giochi di pazienza: Un seminario sul “Beneficio di Cristo” (Turin: Einuadi, 1975), p. 84. This is the opening quotation of Part I of The Sphere and the Labyrinth and I think Tafuri himself is sometimes also biting his own tail when he makes sweeping conclusions regarding the Ichnographia of the Campo Marzio. I am not unaware, however, as to fitfulness of this quotation especially with the “puzzling” aspect of the Ichnographia. In the opening paragraphs that follow, Tafuri speaks of the “language of architecture” and it is here that I can instead introduce my own theory of plans themselves being the texts that architects most know how to read and write. I can already see that I am off to a good start just with this one topic of mistakes and inversions. "Mistakes and Inversion - A Prefatory Review"
I have decided that an essay/article on “mistakes and inversion” with regard to the Ichnographia is indeed going to be my first writing on Piranesi’s plan of the Campo Marzio. Like the title suggests, it will be both a preface to further texts on the Ichnographia as well as a review of the literature on the Ichnographia from the last half century. I almost can’t believe how the theme of mistakes and inversions has come to the fore, yet it fits perfectly and, more importantly, allows me to state my own case in a succinct and introductory fashion. I will work on the final draft throughout March, and it will initially appear in NOT THERE. I will also use the text to rekindle my correspondence with MIT Press. In terms of format, I will follow the “Stirling Muses” and “Promenade Architecturale” layouts. and I imagine at this point the length of the essay my well reach ten pages of text and images; the notes will be separate. After a short introduction from/of myself, I will lists the texts under review and then begin with the mistakes of Fasolo (which are abundant) and I will concentrate specifically on those that by their nature are mistakes of inversion. I will end this with the illustration captions from Autonomy and Ideology. I will then move on to my own mistake (unless I find other mistakes in the other texts). I forgot that I may begin the essay (after my personal intro.) with Piranesi’s own oft quotes text regarding the asccusations of the Ichnographia being a pure fantasy. I will finish up the first round of mistakes/inversions with mention of the Krieger mistakes and his quotation regarding the ic’s visual perplexity. The second group of mistakes/inversions will begin with the quotation from Allen concerning Piranesi’s own view of the Campo Marzio as ultimately an inversion of Rome itself, rather than being an appendage to the city proper, it is actually the other way around. I will give Allen credit for latching onto the inversion theme, but I will also have to dispute his overall reliance on Tafuri’s ideas on the Ichnographia. At this point I can bring up all my various disputes with Tafuri’s ideas which I can now clearly demonstrate to be incorrect or just plain wrong. For example, I can begin with Tafuri’s statement that the city “remains an unknown.” I can easily dispute this with calling attention to the axes of life and death, and then comparing these axes to the ones that Tafuri (incorrectly) labels as the main axes of the Campo Marzio. Taking the dispute further, I will address the notion of archeological mask and how again this is note correct because overall Piranesi’s “archeology” is relatively sound. At this point I can bring Bloomer into the picture and how she more than anyone else seems victim to the notion of mask. To close this segment, I will bring Rossi and the Cemetery of Modena and hence lift the “mask” once and for all (because the cemetery is also a reënactment). The third point (perhaps final) will be to address Piranesi’s own mistakes and inversions, particularly the inversion of the Circus Flaminius (which I now know to be also exchanged in location with the theater of Balba, which further shows Piranesi’s intentional “mistakes” to make a specific point). I will make the point that Piranesi makes the mistakes, first to call attention to specific points, and second to highlight the notion of inversion. Piranesi is indeed being theatrical, which is only natural because of the whole notion of reënactment. I will at this point discuss the Ichnographia’s Triumphal Way and how Piranesi redesigns (reënacts) the Way making it more ideal to its purpose (marching through the theater district). This will be a condenses version of the full Triumphal Way story. I will show how it (on the Ichnographia at least) ends at the Temple of Janus--a perfect example of inversion--and then demonstrate how following the Triumphal Way in reverse manifests the Christian theme of salvation and redemption, ending at the inverted “basilica”--the upside-down “inverted” crucifixion of St. Peter. At this point I can proclaim that the Ichnographia not only represents the history of ancient pagan city of Rome, but also the Christian city of Rome. This brings in Augustine’s The City of God and also Bloomer’s notion of the Ichnographia transcending time. I can conclude withthe Scenographia as the stage upon which Piranesi reënacts--this is the first scene and the “play” is about to begin. In the course of the “play” the most eggregious “mistake/inversion” is the misplacement and misorientation of the Circus Flaminius and its actual exchange with the Theater of Balba. This “mistake” manifests a composition of inverted theaters--essentially a double inverted theater. This configuration becomes one of the Campo Marzio’s final scenes and thus represents the double inverted “theater” of Rome’s own history--the narrative of pagan Rome and the narrative of Christian Rome, and in the Ichnographia the one story is indded a reflection of the other.